Technical Products, Inc. have tons of the finest quality Grade "A" Lava (Alumina Silicate) in stock and ready to deliver. Top quality and low prices- an unbeatable combination. 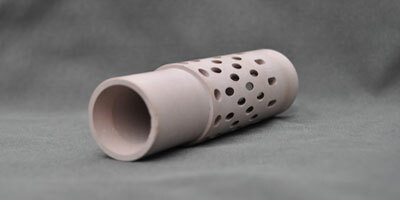 Our staff has vast knowledge and experience in firing ceramics. Technical Products, Inc. has on-site several kilns to meet the demands of our customers. If you require just a firing process on your parts look to TPI we do that too. Grade "A" Lava is a natural ceramic material. In chemical terms it is a hydrous alumina silicate. We supply this material in standard rods, blocks, and plates as well as special shapes. Lava is a natural mineral that is mined, it may have grain, fractures, color, or other natural characteristics out of TPI's control. Thermal processing may also cause inconsistencies as this material grows. TPI tries to control sizes and fractures but we claim no responsibility for fractures after firing. 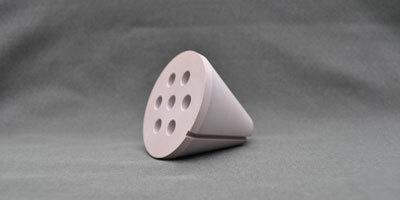 Unfired Grade "A" Lava is a free machining material that can be shaped using most machine tools. The material is non-toxic but as with any airborne dust it could a be respiratory irritant if directly inhaled. Common sense and dust collection systems are recommended. 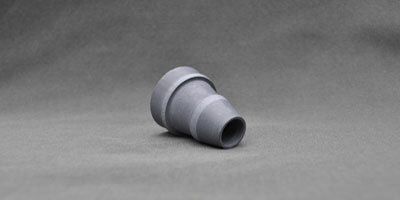 Machined parts should be placed in a cool furnace and protected from direct heat radiation. The use of refractory furniture, boxes,or baffles is recommended. A heating rate of 200ºF - 250ºF per hour is typical. The rate of heating should not exceed 300ºF per hour. 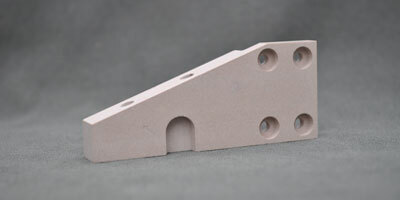 Parts with cross sections exceeding 1/2" are more critical and cracking may occur during the firing cycle. If a cross section of 1/2" or greater is unavoidable, a heating rate of approximately 50ºF - 150ºF per hour and strategically placed stress relief holes may help minimize cracking. The maturing temperature of Grade "A" Lava is between 1850ºF and 2000ºF. The temperature should be maintained for approximately 30 minutes up to 1/4" cross section and 45 minutes for 1/2" and greater cross sections. Fired pieces may be removed from the furnace after cooling below 200ºF. During the firing process, Grade "A" Lava expands approximately 2%. A temperature of 2000ºF should not be exceeded. If 2000ºF is exceeded, crystallization, distortion, shrinkage and a loss of stated material properties will occur. As with most natural materials, texture, color, hardness, machinability, final expansion, and ideal firing temperatures may vary. L911A color changes from dark gray to a pink/tan color after firing processes have been performed. Please feel free to contact our technical staff with any additional questions that you may have. Note: The information provided on this page is given as a guideline only. Specific applications may require other processes. 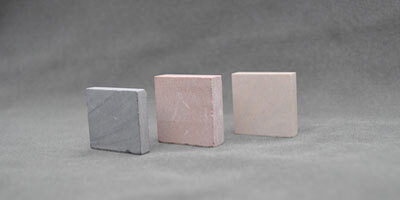 Alumina Silicate is known for its high temperature use, excellent thermal and low cost. Grade "A" (L911A) may have grain, fractures, color, or other natural characteristics. UFL1-0804 1/2" Dia. x 4" UFL1-3604 2 ¼" Dia. x 4"
UFL1-0806 1/2" Dia. x 6" UFL1-3606 2 ¼" Dia. x 6"
UFL1-0812 1/2" Dia. x 12" UFL1-3612 2 ¼" Dia. x 12"
UFL1-1204 3/4" Dia. x 4" UFL1-4804 3" Dia. x 4"
UFL1-1206 3/4" Dia. x 6" UFL1-4806 3" Dia. x 6"
UFL1-1212 3/4" Dia. x 12" UFL1-4812 3" Dia. x 12"
UFL1-1604 1" Dia. x 4" UFL1-6404 4" Dia. x 4"
UFL1-1606 1" Dia. x 6" UFL1-6406 4" Dia. x 6"
UFL1-1612 1" Dia. x 12" UFL1-6412 4" Dia. x 12"
UFL1-2004 1 ¼" Dia. x 4" UFL1-7204 4 ½" Dia. x 4"
UFL1-2006 1 ¼" Dia. x 6" UFL1-7206 4 ½" Dia. x 6"
UFL1-2012 1 ¼" Dia. x 12" UFL1-7212 4 ½" Dia. x 12"
UFL1-2404 1 ½" Dia. x 4" UFL1-8004 5" Dia. x 4"
UFL1-2406 1 ½" Dia. x 6" UFL1-8006 5" Dia. x 6"
UFL1-2412 1 ½" Dia. x 12" UFL1-8012 5" Dia. x 12"
UFL1-2804 1 3/4" Dia. x 4" UFL1-9604 6" Dia. x 4"
UFL1-2806 1 3/4" Dia. x 6" UFL1-9606 6" Dia. x 6"
UFL1-2812 1 3/4" Dia. x 12" UFL1-9612 6" Dia. x 12"
UFL1-3204 2" Dia. x 4"
UFL1-3206 2" Dia. x 6"
UFL1-3212 2" Dia. x 12"
1/2" - 3/4" Dia. +.015"/-.000"
7/8" - 2 1/4" Dia. 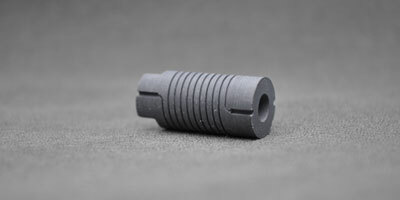 +.060"/-.000"
Tight tolerances available upon request & maybe subject to price change. Item are not sold Online. Please call for pricing. UFL2-020404 1/8" x 4" x 4" UFL2-240404 1 ½" x 4" x 4"
UFL2-020606 1/8" x 6" x 6" UFL2-240606 1 ½"x 6" x 6"
UFL2-021212 1/8" x 12" x 12" UFL2-241212 1 ½" x 12" x 12"
UFL2-040404 1/4" x 4" x 4" UFL2-320404 2" x 4" x 4"
UFL2-040606 1/4" x 6" x 6" UFL2-320606 2" x 6" x 6"
UFL2-041212 1/4" x 12" x 12" UFL2-321212 2" x 12" x 12"
UFL2-060404 3/8" x 4" x 4" UFL2-480404 3" x 4" x 4"
UFL2-060606 3/8" x 6" x 6" UFL2-480606 3" x 6" x 6"
UFL2-061212 3/8" x 12" x 12" UFL2-481212 3" x 12" x 12"
UFL2-080404 1/2" x 4" x 4" UFL2-640404 4" x 4" x 4"
UFL2-080606 1/2" x 6" x 6" UFL2-640606 4" x 6" x 6"
UFL2-081212 1/2" x 12" x 12" UFL2-641212 4" x 12" x 12"
UFL2-120404 3/4" x 4" x 4" UFL2-800404 5" x 4" x 4"
UFL2-120606 3/4" x 6" x 6" UFL2-800606 5" x 6" x 6"
UFL2-121212 3/4" x 12" x 12" UFL2-801212 5" x 12" x 12"
UFL2-160404 1" x 4" x 4" UFL2-960404 6" x 4" x 4"
UFL2-160606 1" x 6" x 6" UFL2-960606 6" x 6" x 6"
UFL2-161212 1" x 12" x 12" UFL2-961212 6" x 12" x 12"
UFL2-200606 1 ¼" x 6" x 6" UFL7-081212 8" x 12" x 12"
UFL2-201212 1 ¼" x 12" x 12"
1/8" - 1/4" Thick +.015"/-.000"
3/8" - 1/2" Thick +.030"/-.000"
3/4" - 6" Thick +.060"/-.000"
UFL4-0804 1/2" sq. x 4" UFL4-3204 2" sq. x 4"
UFL4-0806 1/2" sq. x 6" UFL4-3206 2" sq. x 6"
UFL4-0812 1/2" sq. x 12" UFL4-3212 2" sq. x 12"
UFL4-1204 3/4" sq. x 4" UFL4-4804 3" sq. x 4"
UFL4-1206 3/4" sq. x 6" UFL4-4806 3" sq. x 6"
UFL4-1212 3/4" sq. x 12" UFL4-4812 3" sq. x 12"
UFL4-1604 1" sq. x 4" UFL4-6404 4" sq. x 4"
UFL4-1606 1" sq. x 6" UFL4-6406 4" sq. x 6"
UFL4-1612 1" sq. x 12" UFL4-6412 4" sq. x 12"
UFL4-2004 1 ¼" sq. x 4" UFL4-8004 5" sq. x 4"
UFL4-2006 1 ¼" sq. x 6" UFL4-8006 5" sq. x 6"
UFL4-2012 1 ¼" sq. x 12" UFL4-8012 5" sq. x 12"
UFL4-2404 1 ½" sq. x 4" UFL4-9604 6" sq. x 4"
UFL4-2406 1 ½" sq. x 6" UFL4-9606 6" sq. x 6"
UFL4-2412 1 ½" sq. x 12" UFL4-9612 6" sq. x 12"
3/4" - 6" Square +.060"/-.000"